One night in Bangkok.....: The Rabbit Is Everywhere! RedBubble has a special section called "The Buyer's Booth". It's a place where people that have purchased t-shirts and stuff on RB can send in a photo of themselves, or whomever, sporting their latest fashion acquisition. 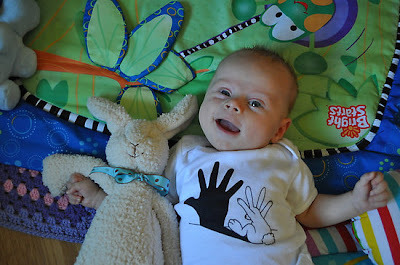 Someone was nice enough to send in a shot of their son Zak wearing one of my "Rabbit Hand Shadow" baby tees. I am not sure who the rabbit laying next to him is, some wannabee I guess. Zak has a pretty big smile on his face, but I am not sure if it is due to the fact that he knows he is looking sharp in his new Mobii art t-shirt, or because he just filled his diaper. Hey, as long as he's happy!